I’ve been a fan of the Wizard of Oz books since I purchased a copy of The Emerald City of Oz from one of those book sale fliers you got in grade school. With that book, my love of the land of Oz outside of the Emerald City was cemented. When Gregory Maquire came out with Wicked! : The Life and Times of the Wicked Witch of the West, I was smitten. I devoured the whole thing in a week. So when the opportunity came to review the last book in the series – Out of Oz, I leapt at the opportunity, remembering how much I loved the first. One of the things I appreciated about this book was the series summary/history in the beginning. The last book came out 15 years after the first and the most recent book was still 2 years ago. It was nice to get caught up on and reacquainted with everyone, as it were. Out of Oz picks up during the life of the Wicked Witches granddaughter, during an intense civil war where Munchkinland succeeds from Oz. Glinda is placed under house arrest, the Cowardly Lion is running from the law, and Dorothy has returned. 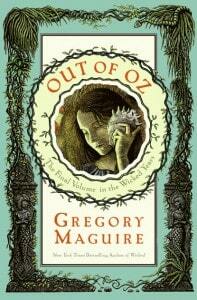 A grown-up version of the story of Oz, there is much more detail than in Baum’s other Oz books and that’s a GOOD thing. It has familiar characters, names, and places but feels like visiting your hometown as an adult. Things just feel different. The story and twists and turns were masterfully told. I had a hard time putting it down and didn’t post on my blog for about a week because I chose to read this instead. The only part of the book that I didn’t enjoy was the references to several unorthodox relationships. As a Christian, I don’t really enjoy that sort of thing. Nothing was graphic and it was tastefully done, if you can say such a thing about a love triangle, a human and Animal marriage and another one I won’t detail because it’s HUGE spoiler. It seemed to me that he could have found another way to work the conflict to make them unnecessary, but I’m sure he appealed to a much greater audience with it. Overall, I would say that if you don’t mind mainstream fiction, this was a FABULOUS read. If you are a little more discerning in your moral taste, you’ll have to read more about it and decide for yourself. The story was great and the characters were well written. If you haven’t read ANY of them, go and get them today – these would be great vacation/cruise reads!! Jen currently makes her home in the Great White North and is a wife and mother to 2 beautiful girls. She writes at about books, living the Catholic faith, holiday celebrations, creating beautiful & useful systems and anything else that is beautiful, good and useful at Happy Little Homemaker. She also shares deals, tips and product reviews to help save time, money and sanity at Happy Homemaker Reviews. I find your Oz review fun, your assertions of self-declared ethics not so much. You are entitled to either of course, and I to disagree with either (or not). As to whether your ethics are really Christian there’s not much to say. It seems you wish to leave yourself and this reader split-minded: either an immoral reader or a moralizing vegetarian food critic who seeks into MacDonalds for an Big Mac once in a while just to prove how bad hamburgers are. I haven’t read any of the books so reading your review is helpful. I’m also a Christian so it means a lot to me that you can write a review that is based on shared faith. I loved Baum’s books and characters. I’ll have to read these. Thanks!